High gas prices are stretching budgets so much, that people are making their credit card payments late. The American Bankers Association reported Wednesday that the seasonally adjusted percentage of credit card accounts 30 or more days past due rose in the April-to-June quarter to 4.81 percent. Oh yeah, and the credit card sompanies have increased their minimum payments. Don't you love it when corporations have our interests at heart? Here's an interesting cat fact: Cats aren't mentioned in the Bible. How can the state of Jesusistan reconcile the Truth as explained in the Bible (that there are no cats) with all the cat food commercials? Lots and lots of prayer is going to be needed. Praise Jebus! The Mainstream Media lied again! Where are all the people who cried for Bush's head after reports of the murders in the Superdome and New Orleans Convention Center now? Turns out the pile of bodies the press was reporting amounted to a grand total of 10. At the superdome, four people died of natural causes, one from an overdose, and one from a suicide. At the convention center, four people were found dead, and only one had been murdered, and the authorities beleive he had been brought there, not killed there. The Media, breathlessly eager to fill countless hours of round-the-clock Katrina coverage, repeated unverified stories and rumors. And stories about people helping people at the Superdome went tragically unreported, because the media thrives on bad news. In short, the whole story of the collapse of civilization was just plain fiction. So just where are all the bandwagoneers who called for Bush's head because hundreds of people were being murdered and children were being raped and killed? Still criticizing Bush, just for something else, and not admitting their errors. 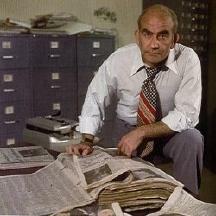 They bought into the Media's factual errors, as they have before (and no doubt will again), and that's why Lou Grant is staring out from this page. Despite what the Left says, the Media has a hypnotic influence over the people in this country. If the news reader says hundreds are dead in the Superdome, then it must be true. The real danger to the American people isn't the Republicans or the Democrats. It's the Media. This morning I put my unlucky sandals up on eBay. 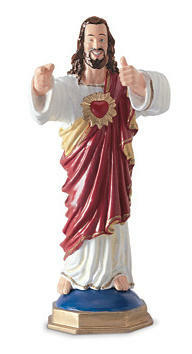 Other people have sold sillier items for more $$, so I figure, "What the heck!" And, since I'm tired of begging you people to donate to me, now you can actually buy something from me! Or, alternatively, you can help me out by spreading the word! Tell everyone you know about the auction, especially those folks that are super generous. Silo and Rory, the gay penguins, have split up. These penguins were touted as proof that homosexuality was a genetic trait But now, Silo has pulled an Anne Heche, and moved in with Scrappy, a female penguin. No one knows why Silo made the switch, but maybe Scrappy was "easier" than Rory. Or cuter. There were no photos, so it's hard to know for sure. One thing is sure, however: Silo is letting Little Silo do all the thinking, and that's what life is really all about: Orgasms. If you're the least bit squeamish, don't look here. I thought I Would show you what $7000 can buy. That's the scar on my ankle. I think the screws are under there. 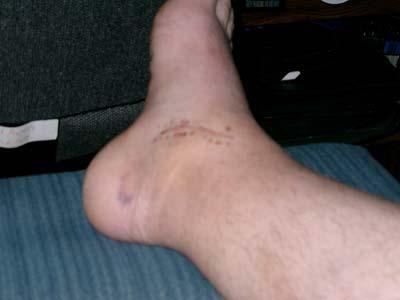 In two weeks, they will take the screws out, so I'll have another scar, and another couple of grand in debt. All because I don't have golf spikes! In a financially related note: I am going to try to sell the shoes I was wearing on eBay with my sad, sad story. If people can sell demonic toys for lots of money, why can't I sell my unlucky shoes? The NFL has once again demonstrated its alliance with the Bush administration in their oppression and hatred of the homeless victims of Hurricane Katrina. The Minnesota Vikings selfishly defeated the New Orleans Saints, 16-33. Don't they have any compassion? If Clinton were in office, He would make sure the Saints got the Lombardi Trophy. We have to carry on His empathy, and make sure the Saints are declared NFL champions. Only then will Bush's evil legacy be expunged! Only then will our nation be on the path to righteousness. Take a stand! Make a difference! Demand fairness for the homeless! Demand fairness for the victims of Katrina! Demand fairness for the New Orleans Saints! When I arrived in Japan 20 something years ago as an exchange student, I had to learn all about the Chinese Zodiac. i also had to remember my blood type. These two particular pieces of information were used by my Japanese class mates to get a handle on me, lmost like we use the horoscopes. Anyway, I wa particularly happy to learn I had been born in the year of the tiger, versus the Year of the Rat, or the Chicken.